The young people move swiftly in between the red-brick buildings with high wooden roofs. Though it is February, the wide blue skies, the bright sun, the vast fields and the cool wind coming in from the banks of the River Alde bespeak the warmth of a musical and creative heritage of which this lands are proud. Visitors of the area seem more relaxed as they contemplate the fields, admire the sculptures scattered among the nature and wander past the small gift shops. As I entered the main alley where the renowned Snape Maltings concert hall stands to the left, I noticed young people swiftly moving ahead and disappearing into the building on the right. Following them, I began to hear musicians tuning their instruments, repeating a few bars over and over again. In this curious cacophony, an Arabic rhythm on tabla reached my ears, yet before I realised its source, my attention was arrested by a maqam emerging from a violin trying to engage into a dance with a more distant ney. The short melodies and repetitive rhythms entwined and amplified, and though they did not seem to converse on a musical level, they all formed an astoundingly homogeneous creative atmosphere. Suddenly, all the sounds quietened down and I was left in silence wondering if all the melodies and rhythms that seemed to echo against the walls were but a product of my imagination. But, slowly opening the door of one of the rooms, I found a group of very young musicians surrounding their tutor. It was the third day of the workshop led by the European Egyptian Contemporary Music Society: qanun player Saber Abdel Sattar, percussionist Nesma Abdel Aziz, violinist Hossam Shehata, ney player Hany Al-Badry, composers Rosilla Adel and Bahaa Al-Ansary – which also brought in two British musicians, Tom Coult and Jan Hendrickse. They have all been working with young talents enrolled in the Aldeburgh Young Musicians (AYM) programme. And, in addition to the Egyptian team’s work, another group was enrolled in the AYM’s Brass Camp. 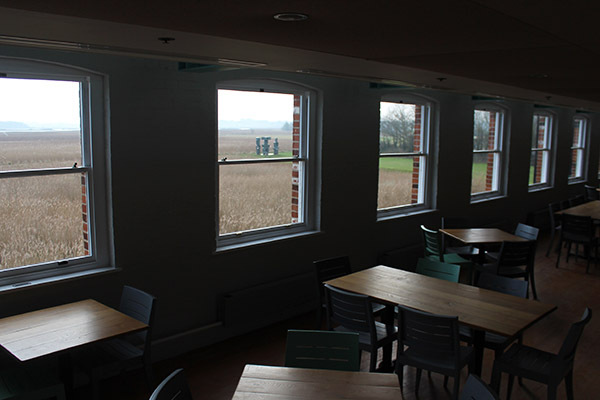 The workshops were held between 12 and 17 February at the Snape Maltings in the village of Snape on the coast of Suffolk. The neighbourhood is proud of being home to the renowned British composer Benjamin Britten (1913-1976), and of providing inspiration for his many compositions and activities. 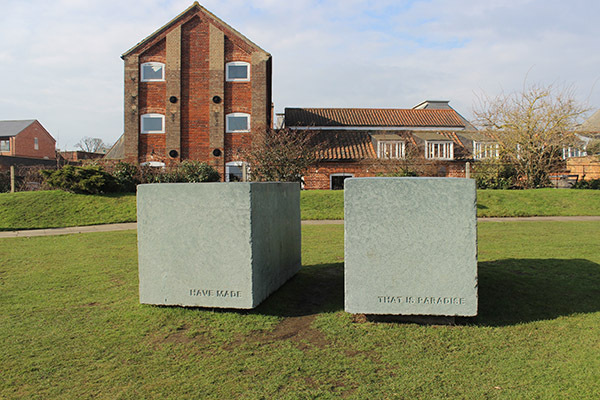 In 1944, together with tenor Peter Spears, Britten made Snape his home and studio, and by incorporating other historical buildings that served as malting locations of barley for the brewing of beer, he expanded the area to an art complex. A few years later, the composer moved to Aldeburgh, a small coastal town dotted with colourful houses and located a few miles from Snape. Britten and Spears settled in the Red House (now a museum commemorating the composer and run by the Britten-Spears Foundation), yet Snape remained the composer’s creative centre. Constantly expanding the area, it was much later, in 1967, that Britten turned one of the edifices into an over 800-seat concert hall which could finally adopt the Aldeburgh Festival Britten had launched in 1948 – one of the world’s most prestigious classical music festivals. The festival was only one of several activities through which Britten practised his strong belief that “a composer should be useful to the community”, constantly drawing plans of how to engage with the local, regional and international scene through music. In 2012, marking the composer’s jubilee and paralleling the London Olympics as part of the Cultural Olympiad, Snape Maltings was home to the one-time Aldeburgh World Orchestra, an ensemble consisting of over 120 young professional musicians from 30 countries including Egypt. 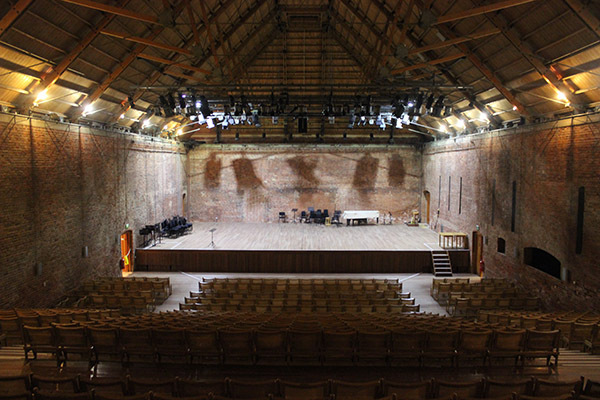 Today, Snape Maltings is run by an eponymous company that until late last year was known as Aldeburgh Music. The company continues to hold to Britten’s values through sustaining the festival and engaging in activities that draw the community together through music. It also embraces young composers and musicians giving them an opportunity to develop their talents. In this context, among Snape Maltings’ youngest programmes is the Aldeburgh Young Musicians (AYM), the only endeavour that focuses uniquely on the UK’s brightest young talents. 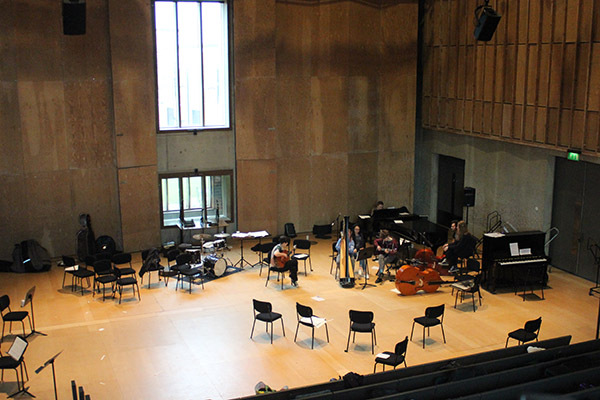 “Funded in large part by the government, the Aldeburgh Young Musicians programme is an alternative to a junior conservatoire,” explains Colin Virr, head of the Aldeburgh Young Musicians at Snape Maltings. The programme’s mission is to embrace the most remarkable talents aged eight-18, instrumentalists, vocalists and composers, and allow them to develop professionally. “At the moment, the AYM has 60 young musicians under its umbrella. The programme we offer is like a jigsaw; it is tailor-made and everyone follows an individual programme,” Virr adds. It is not easy to reach Snape (or Aldeburgh for that matter), the journey often requiring several connections. “All of our young musicians come to Snape during long weekends or holidays and work intensively. They stay here, live together, build a creative community. Yet apart from those sessions, we also organise individual lessons, which take place throughout the year and more locally, close to where the students live. Since they are a relatively small group, we can focus better on their needs, find the right teachers, meet their parents and plan their individual professional development. In short, we manage their musical lives,” Virr explains, adding that he also takes care of the funding, acts as a mentor, even a father while the musicians are at Snape Maltings. Through a variety of sessions, the AYM programme exposes the young talents to all possible musical genres “so they can become very rounded. Even if many of them are focused on their preferred genre, some are amazing orchestra players and others prefer jazz improvisations, we also want them to use their instruments in different kind of musical settings,” Virr explains, pointing to the vision behind his collaboration with the European Egyptian Contemporary Music Society (EECMS), a body founded and managed by Sherif Al-Razzaz. The British Council Egypt had been asked to “suggest a regional ensemble which could benefit from taking part in an AYM creative residency where the visiting ensemble would get a unique and inspiring opportunity to share knowledge and experience of regional musical culture with the ‘next generation’ UK musicians,” Cathy Costain, Head of Arts at the British Council Egypt explains. Having provided a few options, the AYM’s choice of EECMS seemed the most suitable, since the EECMS’s hallmark activity lies in creating bridges between heritage and contemporary classical music. “The EECMS was asked to demonstrate new styles and techniques to the young students while they had an opportunity to develop collaboratively and artistically, making useful connections and building a profile in the UK,” Costain adds. And, indeed, during the week of sessions, the Egyptian musicians have added a new segment of musical practice to the AYM, gaining the students’ interest and generating enthusiasm. The workshops have allowed the AYM to introduce the students to Arabic musical idioms. While the students explored samples of the Arabic traditions, they could grasp their presence as well as adaptability to contemporary musical realities. At the same time, the students had an opportunity to explore the instruments brought along by the Egyptian musicians such as the ney, qanoun and Egyptian tabla, and learn about Arabic modes and rhythms. 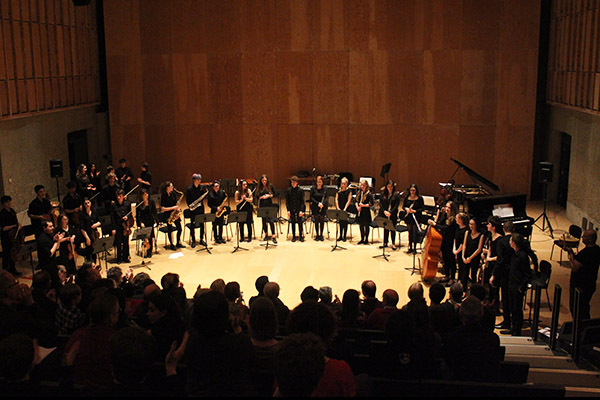 The final outcome was a fusion of experiences with an Open Session performed to the audience at the Britten Studio, a small hall at Snape Maltings, on 17 February. 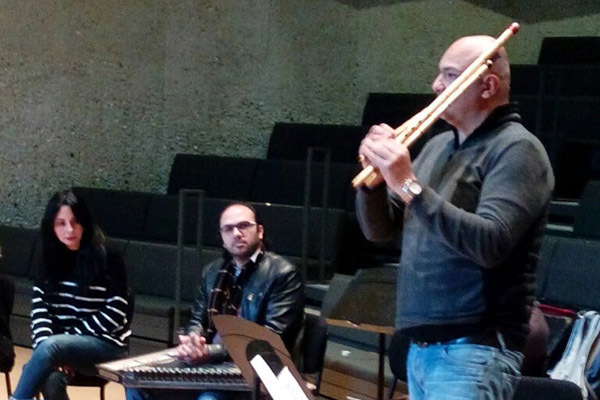 During the workshop with young students, the Egyptian musicians introduced several elements of the Arabic music canon. Percussionist Nesma Abdel Aziz focused on the dialogue which can be developed between the Western and Arabic percussions. She encouraged the students to move out of their comfort zone and explore the adaptability of their percussions to repertoires coming from other cultures. She also demonstrated the Oriental percussive instruments’ ability to participate in Western repertoires. 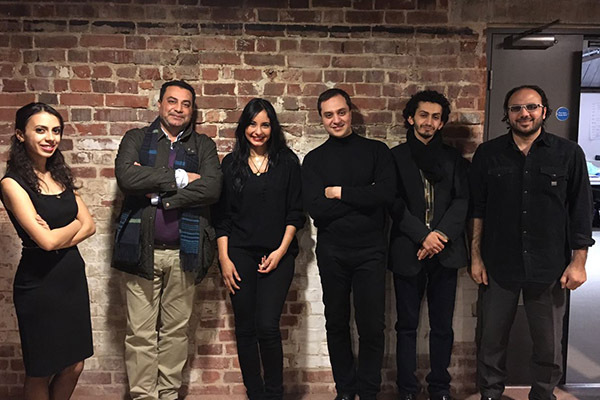 The ney player Hany El Badry, who worked with woodwinds, began with listening sessions, allowing the students be soaked in music by Arabic composers such as Abdel-Wahab before they proceeded to playing. While El-Badry’s preliminary plans were to introduce a broad scope of purely scientific aspects of the Arabic music to the AYM, having met the students, he decided to focus on four maqamat through which he taught the students the Arabic technique of playing ney or flute. “It was not easy at first, but they are all very talented and determined. By the time of the Open Session, they had mastered the technique, even if it was not yet completely spontaneous,” El-Badry explains. For his part Hossam Shehata invited his violinst students to tune their violins for Arabic music. This allowed him to explore different maqamat, including those that incorporate the quarter tones. “Holding the differently tuned instruments, at first the students were surprised, even shocked, as they had to reposition their mindset. However, with a little bit of practice, they managed to follow the exercise and enjoy the new level of musical experiences,” Shehata comments. The two composers, Bahaa Al-Ansary and Rosilla Adel found themselves in what they considered a rather tricky situation. “At the beginning, I was not sure what was expected from us,” Al-Ansary comments. Operating on intuition, however, both composers started by exploring Arabic musical idioms, pulling them into a contemporary language. “I tried sketches. Through cooperation with the British composers-tutors, I explored the sound painting territory,” Bahaa clarifies the process, adding that the composition, 15 minutes in Snape – performed during the final Open Session – was written entirely during his stay in Snape Maltings, “a unique and restricted timing that I am not used to. This in itself was a new and creativity-provoking experience for me.” In her turn, Rosillia used some Arabic modes that the other musicians presented to the students during their instrumental sessions as a base for improvisation. 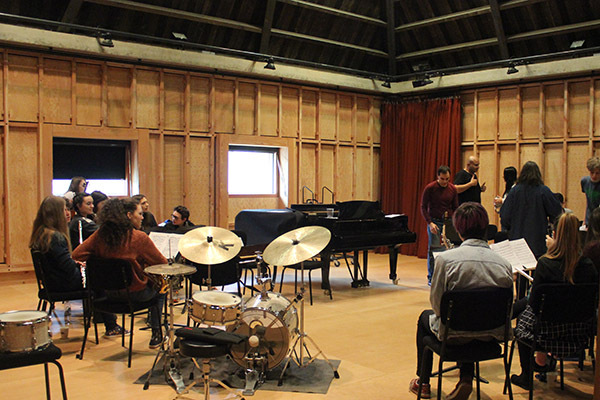 The workshop sessions culminated in Open Sessions at Britten Studio, during which the young musicians – joined on stage by their tutors – performed a range of works, from original compositions generated during the workshop to creative improvisations on Arabic melodies. It was in the final session that the creative energy gave voice to an amalgam of scales and rhythms, bearing testimony to a professional meeting of musical minds. The evening opened with Farah, a composition by Saber Abdel Sattar, named after his daughter and representing her character: childish vitality interspersed by pensive segments. Then came Oriental Impressions, an arrangement by Nesma Abdel Aziz which infused the hall with strong rhythms and a sense of overwhelming musical joy, while Rosilla Adel’s Dance (Un)Chained communicated a sense of freedom. Many other compositions were created by the young musicians during their sessions with the Egyptian tutors. Towards the end of the concert, Hossam Shehata directed the students through Longa Ajam by Abdu Dagher, while Hany El-Badry led them in Longa Hijaz. As the audience showered the young musicians with applause, they left the stage carrying a load of musical discoveries. Abdel Sattar also points to the value of several practical exercises that the students and the tutors followed prior to each session and the concert, which helped them ease the tension. Shehata agrees that the AYM programme’s unique philosophy embraces and directs the young talents, while encouraging self-motivated explorations. “The AYM students have a passion for learning and this is what makes working with them very inspiring. They are extremely dedicated and serious about what they do. It reflects the AYM’s approach to music education and to culture in a broader sense. It is a community that makes music together but also enjoys doing it, with its members supporting one another. It’s definitely a model to follow,” Shehata says. And while Rosilla Adel found in Snape Maltings a unique “family atmosphere,” Shehata underlines that the Egyptian tutors too had to cooperate with one another on many levels, just like the students.